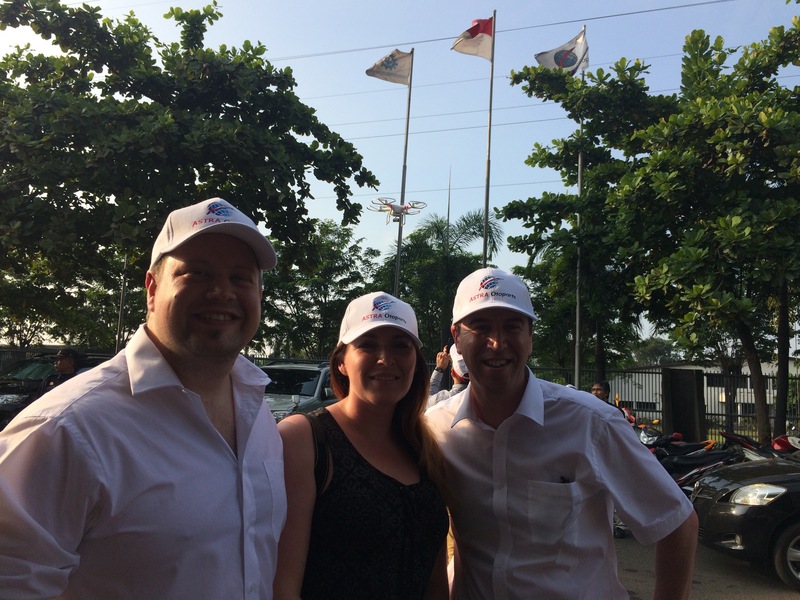 Cranfield University Blogs | Astra but not as you know it! 11 million cars within the market, 1 million of which are new each year – meaning a population of 10 million potential customers. 98 million motorcycles within the market, 7.5million of which are new each year – meaning a population of 90 million potential customers. Astra are the largest group of manufacturing, trade and distribution subsidiaries operating within the market in Indonesia, active since 1967. With continuous growth and diversification through there 47 sister companies in 1998 they became a listed company on the Indonesian stock exchange. Astra Otoparts distributes automotive parts to domestic and export markets, they are currently present within >30 countries spanning Asia, America and Europe. 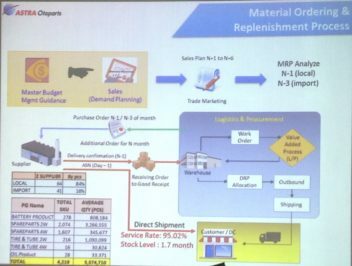 The products are managed mainly through 74 distribution offices, 365 Shop and Drive stores, and >1,200 spare part outlets. 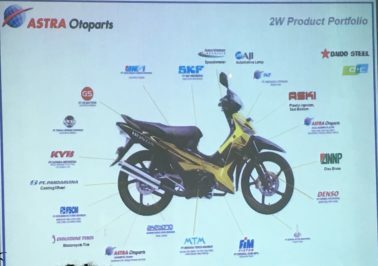 Below demonstrates the product portfolio for ASTRA group of motorcycles. Similar to what we have experienced in other businesses so far this week, Corporate, Social Responsibility is high on the agenda for Astra otopart. The banner under which they concentrate their focus can fall under 1 of the following 4 categories: Education, Health, Environment and Entrepreneurship. Stock holding levels of this magnitude are in place to cope with long import lead times of up to 3 months, and delays within the customs areas at the ports. Building of a New CDC in Jakarta in 2017 is planned which will utilise an ASRS system in conjunction with voice activated picking in order that both hands of the pickers be utilised. 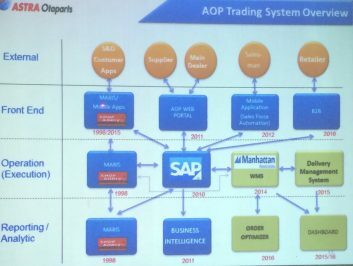 Astra Otoparts are very advanced with their use of SAP and integration with other packages such as Manhattan their warehouse system, as illustrated in the picture below. 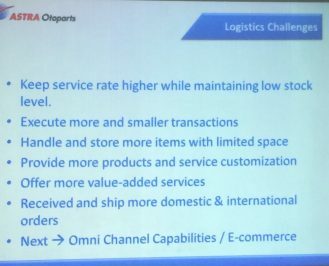 Articulated in the slide below are the main challenges currently facing Astra Otoparts.